Mostly a book-keeping post, here. I've posted something a little more extensive over at Running Times regarding my thoughts on running lately. Although September has been a bit up and down in terms of mileage and energy, I'm really looking forward to really getting back to it in October. And, in a weird way, I'm even kind of excited for the ridiculousness of snowy trails, but I know there will be plenty (as in, five or six months worth) of that soon enough, so there's no need to look too far into the future. Got up really early to run and felt exhausted so I just went back to bed and ran short with Jocelyn before driving down to Creede, CO.
Gorgeous run between 9000' and 10,000'. The aspens were in full splendor, and the air was nippy enough to have me wearing a long-sleeve the whole way. Legs didn't feel great, though. Spent the rest of the day underground in a mine (six hours total) and driving the nearly 6hrs back to Boulder. Bleary run before catching an early flight to Boston for the NB Elite Dealer's Meeting. Kind of a tough day of travel/socializing after getting home from Creede at midnight the night before. Boston is a pretty neat city if you have to be in the East at sea level. Just a nice easy run with Jocelyn before she races tomorrow. Seems like my cold is finally clearing out a bit. I didn't realize there were multiple waves at the start, so after Jocelyn and I got separated waiting in different bathroom lines I missed the 1st wave start and ended up waiting the 4m30sec for the next wave. Spent the first 35min of the race running hard then to catch up with Jocelyn (I had planned to run with her the whole way). Ran a lot harder than I wanted to in order to do that, and then Jocelyn was running a pretty solid pace in the top-10 women at that point, so we weren't just jogging along really for the next bit. Pretty soon, though, she hit a bad patch involving a pit stop and a couple of ankle rolls and a ton of women passed us as Jocelyn regathered herself. After just cruising easy for about five miles, though, Jocelyn decided she wanted to race again and re-passed five or six ladies during the final three miles or so. Solid effort for her for not being in great shape. This race has an exceptional course: point-to-point, almost all singletrack, finish in a park in Aspen, gorgeous aspen groves. Afterwards I was surprised with how worked my legs were, though. Clearly feeling pretty burnt/out of shape right now. Ran down to the field, ran 2 miles barefoot, and ran back home. I was really busy last week with a bunch of non-running activities, so I took it as an opportunity to take a real break from real running, especially since I was fighting a cold all week, too. I'll take a few more really easy days and then look to get into a nice gradual build-up to top fitness by the time December rolls around. Easy shakeout run in CA. 2nd half was barefoot. Ran up the steep frontside of Green at what ended up being a solid tempo effort and eeked out a 31:59. I guess my fitness is still there to some extent, but lately I've been feeling like I'm just out there kind of jogging around not hitting the times on climbs that I usually would for a given effort. It's just that time of year where it would make sense to really be taking it easy but the weather is so perfect that it's tough to not want to be chasing some really nice runs still. Easy morning run. Even on a shorter run like this I can get some great trails right from my doorstep. Pretty standard run but just tried to take it pretty easy on the climbing. Legs felt way better than expected and I wished I had more time this morning to run longer. Felt really flat this run so I just took it easy. Ran up the back of Green and then down the NE ridge trails and then cut over to descend Flagstaff to Eben G. Fine. Felt good on this run, running a bit quicker than usual. Really had the footwork dialed on the way down Fern, descending in a snappy 17:25. Had only planned on an easy run up Flagstaff but the evening atmosphere was so nice that I was inspired to head over and up Green, too. I was treated to an incredible sunset from the summit, which meant that much of the run back down to my house was in the dark. Ran early before yet another busy day at school. Paused briefly to witness a bear rustling around in the pre-dawn light near the Gregory Canyon trailhead. Perfect run on a perfect fall day. Jocelyn was racing the CC home XC meet this morning so I took the opportunity to go run up my favorite mountain. I feel like my climbing has certainly lost a few steps since this summer--things have just felt a bit off since Leadville--but I still enjoyed this run a great deal. I was deliberately taking it pretty much as easy as I could while still maintaining a running cadence the whole way (except for a few steps on the 16 Golden Stairs), but it still felt like a little more effort than only a 2:45 ascent should be. Cruised the descent in 1:43 just enjoying the sun, the aspens, and the mountain. There is no training reason to be getting out to do a longer run like this right now, but I can't resist the opportunity to go run up a 14er--especially Pikes--if I have the chance. Up the back and then down the NE ridge trails to Flagstaff where I went down the fire road that connects into Boulder Canyon and the creek path. Another day of gorgeous weather. Can see patches of glittering aspen everywhere up in the high country. And I guess that's how I do it in the "off" season. Weeks like this show me just how important running is to me in and of itself. Right now I have no imminent competitive goals, but I still feel compelled to get out and run up the peaks and log the time on the trails even without that end-goal impetus of racing. Especially with the demands of graduate school picking up, my daily local summits are absolutely necessary to keep me sane and productive in other areas of my life. Part of me knows that I should probably be taking it a bit easier--especially with a lot of my runs feeling like I've lost some of the pep from the summer--but until the snow really starts flying and making the trails a bit messier I probably won't cut back too much other than to continue to keep the intensity dialed back. In the meantime, I'm going to keep enjoying fall and its perfect running weather. Having said all that, I'm going to be traveling a lot in the coming week, so there's a very real possibility that I will actually scale back the running significantly for the next few days. After any trip back down to Manitou Springs and Pikes Peak, I often come away with some rather grandiose future plans. Something about that mountain really draws me to it. Actually, it's pretty obvious, really. It's gigantic, its aesthetic as a summit is undeniable, and it's so close. Last summer, Matt Carpenter--the undisputed mayor of that mountain--ran from his doorstep to its summit seven days in a row to celebrate his 45th birthday. Running to the top at a casual pace yesterday, I could see--given the right circumstances, and enough time--committing to such an endeavor for, say, a full month. Although I often get annoyed by the crowds on the first three miles of Barr Trail below the Incline turn-off, after this past year's acquaintance with Green Mountain here in Boulder, the idea of getting to know the Barr Trail and Pikes Peak with a similar level of intimacy really appeals to me. Maybe next spring/summer I'll look at giving it a shot if I'm preparing for either Hardrock or the Pikes Peak Marathon. Finally, I can't wait to see these guys next week here in Boulder, about four blocks from my house. So great to be back on the mountain after a near three-week hiatus. Tired after yesterday's double-peak route. Completed this 28ish mile Indian Peaks circuit in a flat-feeling, uninspired 4:50:40 (Long Lake TH to Long Lake TH). But, man, even a bad day in these mountains is still a great day. Late start meant it was really hot. Finished up super-dehydrated. This was a good "get-my-legs-back-under-me" week, but I'm still fairly undecided about my immediate running/racing plans. Right now I'm leaning towards a couple of exciting adventure runs in the next couple of weeks instead of racing. 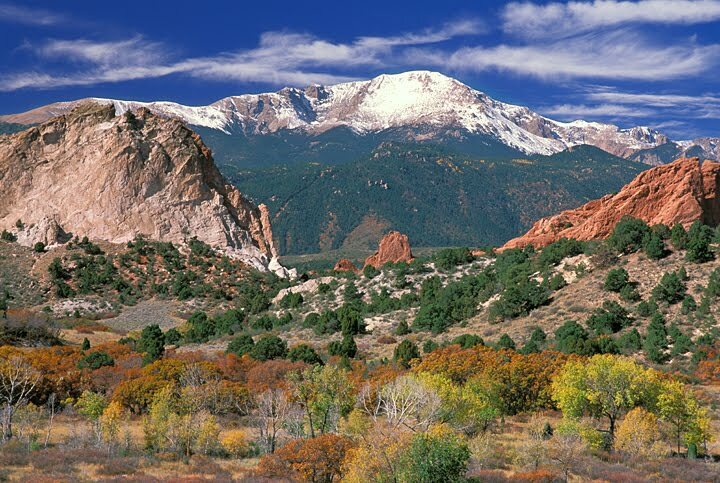 A circumnavigation of Pikes Peak on the Ring The Peak route holds the most interest for me right now, mostly because of my relationship with that region and the geographic significance of running around a big mountain like Pikes.